A Jewish synagogue located on Touro Street, just north of Bellevue Avenue, Touro Synagogue is the oldest existing synagogue in the United States. In 1658, more than a dozen Jewish families, mostly refugees from Spain and Portugal, founded a Sephardic community. A century later, British-Colonial architect and local resident Peter Harrison designed a two-story Palladian house of worship for this community. 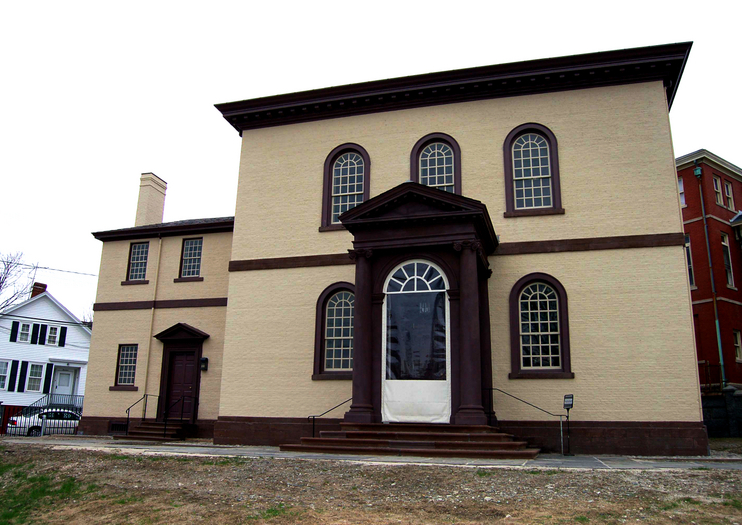 Completed in 1763, and still serving Newport’s Jewish congregation today, its elegant 12-columned interior remains virtually unchanged. A mural on the east wall depicts the Ten Commandments in Jewish; below it is an ark containing the Torah. Legend has it that a small trapdoor in the platform upon which the Torah is read symbolizes the days of persecution when Jews had to worship in secret; it also was supposedly a stop on the Underground Railroad. The John L. Loeb Visitors center has two floors of multimedia exhibits that explore the history of Newport’s Jewish community. Parking for the Touro Synagogue is at the Newport Gateway Visitors Center. From here, it’s a short walk through colonial Newport. Visitors can also take the Newport Trolley to the synagogue. Guided tours of the synagogue last about 30 minutes, and begin at the John L. Loeb Visitors Center located on Spring Street. Visiting hours change per season, please visit the hours page for the most up to date times. Hours: Jul-Sep, 2013: Sun-Fri, Visitor Center: 9:30am-4:30pm, tours: 10:00am-4:00pm. Sep 2-Nov 1, 2013: Sun-Fri, VC: 9:30am-2:30pm, tours: 10:00am-2:00pm. Hours change per season.